For your first home or your empty-nest retreat, Rush offers custom-quality homes for everyone in the South Sound. For nearly 30 years, Rush Residential has designed and built beautiful, timeless homes inspired by the stunning backdrop of lush trees, Mt. Rainier, and the Puget Sound. Founded on the ideals of integrity, resourcefulness, and teamwork, founder Gordon Rush built his first home in Tacoma, Washington in 1987 and the same woman who purchased the home still lives in it today, a testament to construction quality. Buyers at every price point and every stage in life are recipients of Rush Residential’s discerning attention to materials, systems, and construction. An emphasis on quality, design, customer care, and sustainability centers every aspect of the Rush home buying experience around you. At Rush Residential, our mission is to develop communities that exceed expectations. We aspire to move every customer into an exceptionally crafted Rush home that will serve generations to come. When purchased at pre-sale, you will receive dedicated one-on-one time with our Design Team to ensure that your home fits your every need. This design experience will be an outlet for personal expression, truly making the house your home. After-hours calls, weekend walk-throughs, and unerring consideration, our Customer Care team will always treat your home with the same diligence and care that we put into our own. With dozens of builders in the Pacific Northwest, we are honored to be your chosen team and strive to exceed all your new home expectations. With an exceptional warranty program, we make sure starting life in your new home is about enjoyment – not maintenance. 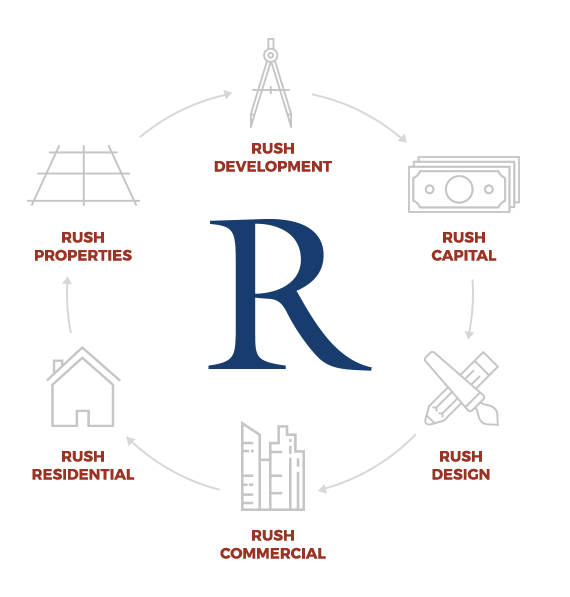 Over the years, The Rush Companies has expanded to include Development, Capital, Design, Commercial, and Properties services in addition to residential homes. As an integrated family of real estate companies, we can truly say we offer an experience unlike anyone else.